Located within a wing of the Palais de Tokyo and is dedicated to modern and contemporary art from the 20th and 21st centuries with paintings by renowned artists such as Picasso and Matisse on display. 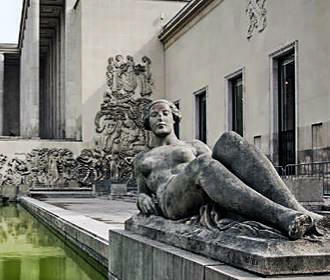 The Palais de Tokyo was originally constructed for the 1937 World Fair in Paris, but it was only after a bequest by Doctor Maurice Girardin in 1953 that meant the collections had outgrown their original museum space of the Petit Palais. So, the decision was taken to re-house major art works that were originally presented at the Petit Palais, and eventually the Musee d’Art Moderne de la Ville de Paris was inaugurated on 6th July 1961 within the renovated galleries of the ground floor of the Palais de Tokyo. 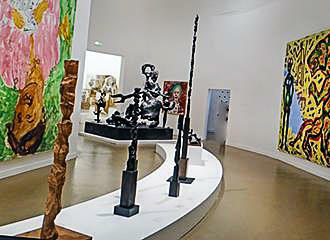 It was then during the 1970s that the National Museum of Modern Art was transferred from the Palais de Tokyo to the Pompidou Centre, which is why there are now two museums in Paris with very similar names, but the one at the Centre Georges Pompidou is known purely as the Musee Nationale d’Art Moderne. Then from the late 1980s there were ongoing restoration works to the building itself plus additional areas were redesigned, such as the basement being turned into a cinema for screening specific videos relating to the collections. 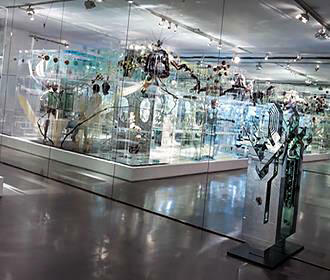 Eventually in 2005 the permanent collections were re-hung and the Musee d’Art Moderne de la Ville de Paris openined its doors once again to visitors from all over the world, and today there are different galleries and presentations, including one of the history of the museum. You can also discover a room dedicated to Art Deco and furniture, along with numerous other areas showcasing sculptures, photography and paintings, along with documents and much more, with the emphasis being the diversity in art through different periods. So, at the Museum of Modern Art of the City of Paris you can discover and learn more about different artistic movements whether it surrealism, decorative arts from the 1920s and 30s through to cubism, etc. 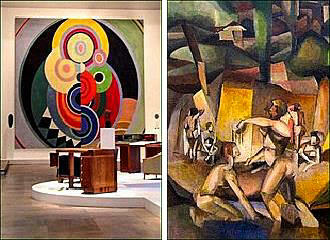 And there are very impressive art works from famous names such as Pablo Picasso, Amedeo Modigliani, Henri Matisse, but there is also a section dedicated to more recent art from the 1980s onwards, which also shows how trends change, so there is something for everyone to enjoy at this museum. As we mentioned before, this particular modern art museum is not to be confused with the Musee Nationale d;Art Moderne, which is located in the Pompidou Centre in a completely different area of the city. Yet this museum is located in the eastern wing of the Palais de Tokyo in the 16th Arrondissement, close to numerous other tourist attractions in Paris, and is open on a Tuesday through to a Sunday from 10am and normally closes at 6pm, although there is a late evening opening to view the exhibitions up until 10pm on a Thursday evening. However, we would like to point out that the Musee d’Art Moderne de la Ville de Paris is always closed on a Monday, along with all national French holidays, plus on the eve of major holidays such as 31st December, it closes far earlier, plus the ticket office closes 45 minutes prior to the museum closing. You may be pleased to know that entry to the permanent exhibition collection is complete free of charge to everyone, but audio guides in different languages including English are available for a cost of €5 as of 2015. But, there is a charge for the temporary exhibitions and these vary in cost from around €5 up to €11 as of 2015 depending upon what is being presented at the time, although it is half price for people between the ages of 14 and 26, and free to children up to the age of 13, plus these are also free to the disabled. Now when it comes to getting here via public transport in Paris the closest Metro stations are the Iena stop of the Alma - Marceau stop, both serving line 9, yet a little further away you have the Trocadero stop that serves lines 6 and 9. Yet the nearest RER train station to the Museum of Modern Art of the City of Paris is the Pont de l’Alma stop serving line C, and the bus numbers 32, 42, 72, 80 and 92 will also get you close by.